They wrote "we are with you" before signing off with the Maori word "arohanui", which means "much love". Fifty people died in shootings at two mosques in Christchurch on Friday. Sir Jerry welcomed the couple with a traditional Maori welcome, called a Hongi, in which participants rub their noses together. Prince Harry also visited Christchurch in 2015 when he was told about the city's efforts to regenerate after an earthquake which struck the city in 2011. 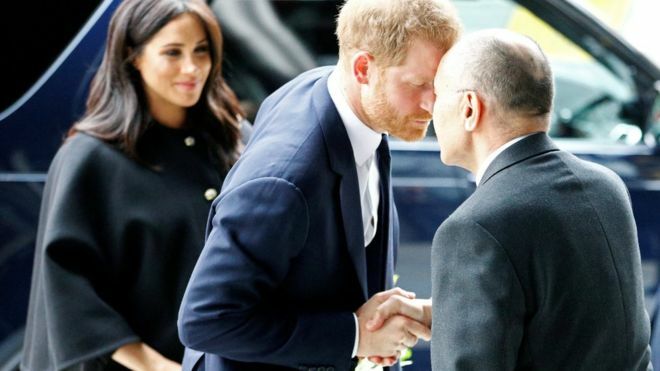 Asked about his connection to Christchurch, Harry said: "It's just very sad." Meghan added she had been left "devastated" by the shootings. Sir Jerry said it was "wonderful" to host the royal guests. He added: "We are overwhelmed by the tremendous amount of support we've received from across the UK." Following last Friday's shootings, the royal couple issued a joint message with the Duke and Duchess of Cambridge, in which they called the attack "senseless", saying: "No person should ever have to fear attending a sacred place of worship." They ended the message with the Maori words "Kia Kaha", meaning "stay strong". The Queen paid tribute to the emergency services and volunteers who helped the injured, saying: "Prince Philip and I send our condolences to the families and friends of those who have lost their lives." She added her "thoughts and prayers" were with "all New Zealanders" at this "tragic time". Australian Brenton Tarrant, 28, a self-described white supremacist, has been charged with murder.